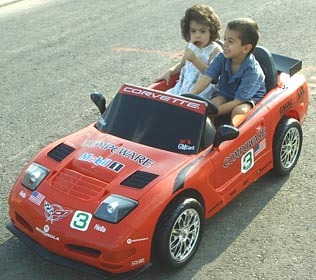 Andrea is shown racing in a Corvette handed down from her cousins Dianna (FCOA #0961) to Ryan (FCOA #1547) to Rachel (FCOA #1548) to Thomas (FCOA #1950), so it's a little worn. 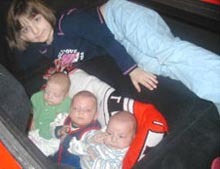 NCCC's 2007 Convention in Nashville was her 3rd convention! Andrea's mom, Janice, has been going to Corvette Cleveland & East Ohio events since she was about 10 years old. 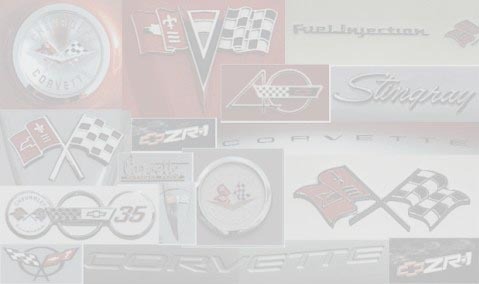 She was the first 2nd generation member of Corvette Cleveland & was the first 2nd generation President of the club. 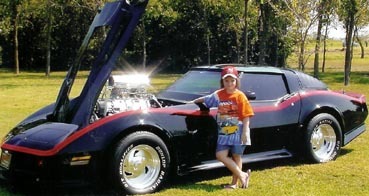 Andrea's dad, Mike, is a member of the NCCC Charity Committee & won a 1985 Corvette at the 1992 Texas Convention. 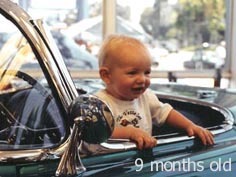 He promises he will have its water pump fixed before Andrea turns 16. Andrea's grandparents Don & Mary Ann, as well as great Aunt Elaine & great Uncle Warren, cousins Tim (FCOA #0123) & wife Cherri as well as their kids Caylie (FCOA #1711) & Hannah (FCOA #2261) are also in Corvette Cleveland. 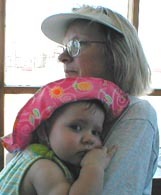 Lauren is resting on Grandma's shoulder while taking a break from watching Autocross action. Lauren's Mom, Kristi (FCOA 0013), watched a lot of Autocross while she was growing up. Grandma Carolyn (1984, 1989, 1992 and 2013 NCCC National Ladies Champion) and Grandpa Dale (1984 and 1989 NCCC National Mens Champion) are Members of Northern Illinois Corvette Club in the Midwest Region. Looks like Hayden is ready to challenge "PePaw" Zschirnt to race at a practice autocross hosted by his club Cowtown Vettes in the Southwest Region. Hanging around with PePaw, he'll sure learn a lot about Corvettes. Here's Kaitlyn with Grandpa Sanders' custom Champagne Pearl 1986 coupe. 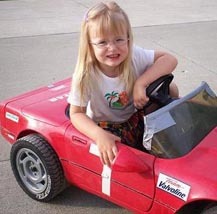 Her grandpa is a member of Palm Springs Corvette Club in the West Coast Region. 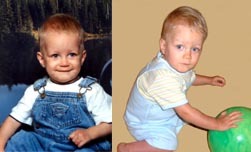 4-year old Michael is pictured here with his younger sister Anna (FCOA #3660). He's having a great time taking her for a spin in their C6 roadster! She's telling him to "slow down, you're making me car sick"! His Grandpa DeSocio is a member of Destiny Corvette Club in the Northeast Region and also has served as the NE Region Executive. WOW! Tonya looks like she's ready to go racing in her dad's 1980 Vette! Tonya's parents belong to Tulsa Vette Set in the Southwest Region. 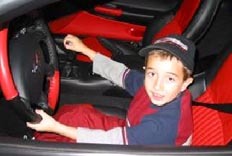 With that big smile you can see that Jarred is pictured here doing one of his favorite things: driving his "race car"! 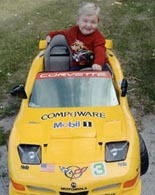 Jarred's Grandpa King is a member of Corvette Troy in the West Ohio Region. 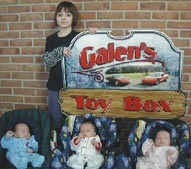 Aleah, Seth and Ethan like to sit in Grandpa's 2003 Torch Red Z06. Lancaster County Corvette Club in the East Region. 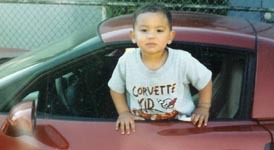 Alex loves showing off in his Aunt "Corvette" DeeDee's 2005 C6 Vette ~ you can see he's wearing his favorite shirt! 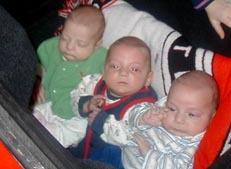 His aunt is a member of Corvettes Unlimited in the West Coast Region. Seeing that twinkle in his eye, you just know that Kyle is dreaming of the day he can get behind the wheel of Grandpa Perz's 1992 coupe! Grandpa belongs to Space Coast Corvette Club in the Florida Region.